Posted October 19th, 2017 & filed under News releases. Limassol, 19 October 2017 – Start-up Bio Alkanol Gel from Kenya won ClimateLaunchpad’s fourth edition. Their business idea is based on their technology to obtain liquid fuel from waste materials. Second prize goes to MeduSOIL from Switzerland; they developed microbe cement. Vienna Textile Lab from Austria came in third with their scalable process to colour textiles with bacteria based pigments. The Grand Final of the business ideas competition with a primary focus on fixing climate change was held in Limassol on October 17 and 18 under the auspices of H.E. the President of the Republic of Cyprus, Nicos Anastasiades. This year’s competition attracted the record number of 1,000 cleantech entrepreneurs applying for National Competitions in 35 countries across the globe. Kenya, Australia and India were among the exciting newcomers to the competition. The challenging ClimateLaunchpad programme in each country consists of Boot Camps and intensive coaching to help participants refine and perfect their business offering, business model, value proposition and pitch. 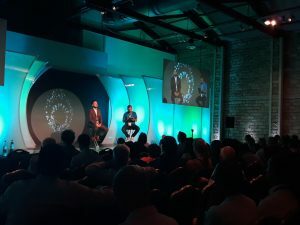 After the National Finals each country selected their Top-3 to enter the Global Grand Final in Cyprus, resulting in 105 teams pitching in front of a renowned jury. Finalists were judged on feasibility, scalability, job creation and climate impact. 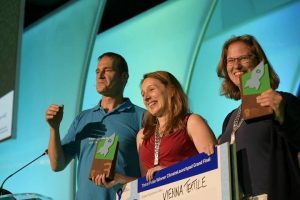 The three Grand Final winners received money prizes, and the Top-10 finalists will now enter the Climate-KIC Accelerator, the world’s first 18-month business school for cleantech entrepreneurs to develop their innovations and fast-track their businesses. More detailed information on all finalists and their green business ideas in areas like energy, water, food, transportation and urban development can be found on www.climatelaunchpad.org. ClimateLaunchpad is the world’s largest green business ideas competition. Its mission is to address the negative impacts of climate change by ways of innovation, invention and entrepreneurship. A green future demands thousands of innovations challenging the current business models. The competition supports aspiring and promising cleantech entrepreneurs with training, coaching and networking opportunities. ClimateLaunchpad operates on a global scale, currently in over 35 countries.ClimateLaunchpad was established in 2014 and is part of the Entrepreneurship offerings of Climate-KIC. Climate-KIC is one of the Knowledge and Innovation Communities (KICs) established in 2010 by the European Institute of Innovation and Technology (EIT), the EU body that creates sustainable economic growth in Europe, tackling the global challenges of this time.